So you’ve made the decision to remodel your kitchen or to build a new home. 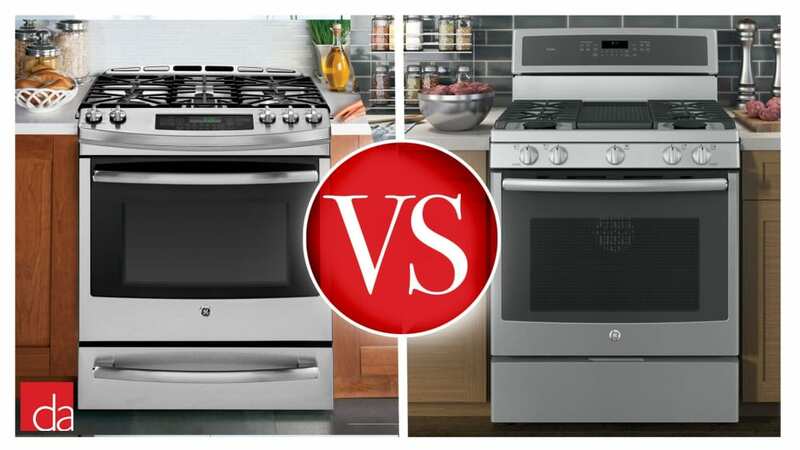 Either way, you’ll be looking for a new stove for that beautiful new kitchen, which could be one of the biggest ticket items in your budget. Besides fuel source (electric vs. gas) which is not generally a choice, the major decision is between a freestanding or slide-in range. What is a Freestanding Range? A freestanding range is installed in approximately 90% of US kitchens. They are exactly as described: freestanding as in unattached to any walls or cabinetry. This range has the lowest cost and greatest selection of any option and is the easiest to clean under and around as they can be pulled out and away from the wall. Their sides are finished as they are unattached to cabinetry so they can be placed anywhere in the kitchen where this is a gas or electrical hookup. Initial installation is also much easier. It’s the “plug and play” option among ranges. For this reason, this is the easiest type to switch in future with another model so long as the width is the same. The other major identifying feature of a freestanding range is that the oven and burner controls are mounted on a backguard at the rear of the range. This also protects the wall behind the range from any spills. A freestanding range is available in a small selection of standard widths, which keeps manufacturing costs lower. The majority are 30 inches wide, but it’s also possible to find 20-inch, 24-inch and 36-inch widths (or even wider for custom versions). The first two are generally used in smaller kitchens such as condos to conserve space. From an aesthetic standpoint, we think slide-in ranges are the clear winner. Unlike freestanding ranges, slide-in ranges have no bulky backguard. The controls are located up front making access more convenient. This setup ensures you’ll never have to reach over a hot pan to adjust burner or oven temperature. Slide-in ranges blend seamlessly with the countertop on either side since the lip of the range typically overlaps the countertop. The cooktop sits flush with the counter which creates a built-in look and displays your backsplash to maximum effect since there is no backguard on this type of range. One of the main benefits of this overlap is cleanability since food and spills can’t drip down the sides of the range. Finally, a slide-in range requires cabinets on either side since the side panels are not finished. The choice of a slide-in vs. a freestanding range depends on several factors. With an existing kitchen layout, the countertop and cabinet location may make the decision for you since you’re dealing with a fixed space. In the case of a full kitchen remodel, decide early in the process on the location and size of the range. When all the options are open as they are with a full remodel, it may be advisable to go with a slide-in since it gives an upscale, built-in look as well as a more modern look vs. a freestanding range. Enhanced cleanability is another plus. If choosing a slide-in range for a remodelled kitchen, make sure you give the dimensions to the contractor who will need them for cutting the countertop. Going with a slide-in range will allow you to showcase a tile or custom backsplash of your choice too. Or, the slide-in could be used in a center island. Freestanding ranges allow for the most flexible installation and the widest selection of styles as well as the most economical options. Within the spectrum of freestanding ranges, there is also a wide selection of choices such as enhanced features at the higher end. If you are replacing an existing freestanding range and don’t want to do a major kitchen reno, your choice is simple. Your width is fixed, which will narrow your choices to features, cost and brand. If you have a freestanding range and want to move up to a slide-in model, make sure that if there is a tile backsplash behind your existing range that it extends all the way to the countertop level. Otherwise you may be faced with a stretch of blank wall and be unable to match the tile. If switching from a slide-in range to a freestanding one, you will generally have a length of countertop behind the range that must be removed or the freestanding range will not fit. After you’ve made the decision between a freestanding or slide-in range, you’ll need to make decisions about durability, extra features, and perhaps size if you’re doing a full kitchen remodel. At the end of the day, it’s better to err on the side of more features and a higher style profile since a good range is used not only every day but could be the centerpiece of your kitchen.